Natural Uric Acid Inhibitors: Can They Work? 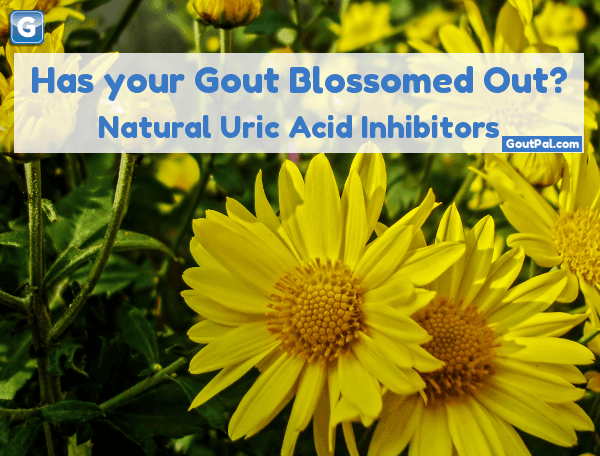 Natural uric acid inhibitors are very popular with gout sufferers. I love the idea of natural gout treatments. However, the reality is that gout sufferers often get misled by false claims. At best this gives a false sense of security. At worst, it delays effective treatment. Delays prolong the agony. Delays increase joint destruction from excess uric acid. Having said all that, I will always be interested in herbal gout medicine. As with all other gout treatment, everything depends on the individual. What suits one gout sufferer might be wrong for another. There is absolutely no reason why you should not try herbal gout medicines. But, you may need some help and guidance. All gout medicines have one or two functions. They might help relieve gout pain. They might help lower uric acid. A few do both. There are two types of uric acid lowering medicines. Some encourage uric acid excretion. Some discourage uric acid production. Here, I’m looking at this last group, particularly natural uric acid inhibitors. What are Natural Uric Acid Inhibitors? Natural uric acid inhibitors are plants that block uric acid production in your body. Uric acid is produced when an enzyme, xanthine oxidase (XO), breaks down purines. Purines might come from flesh that you eat or from your own flesh. If xanthine oxidase is blocked, then uric acid production is reduced. That is how allopurinol and Uloric work. During my research into chanca piedra, I learned a new term: phytomedicine aka phytotherapy. This relates to the medical application of phytochemicals. Phytochemicals are chemical compounds that occur naturally in plants. These work in the same way as allopurinol and Uloric. There are several compounds that are natural uric acid inhibitors. Would you like to see a list? In the gout forum, I’ve voiced my personal concerns about natural uric acid inhibitors. How can we ascertain correct dosage, and how can we be sure that dosage is safe? But we all know that gout treatment has to be personal. It may well be that one of the natural uric acid inhibitors from my chart is perfect for you. The best way to find out is to join the discussion I mentioned earlier. Better still, start your own gout topic about your experiences of, and opinions on, natural uric acid inhibitors. To make the right choice from natural uric acid inhibitors, you need personal gout treatment plans. My plans require nothing from you but your time. We spend time together, investigating your choices and choosing the right options for you. I’m with you every step of the way to stop your gout permanently. For more information, see my personal gout treatment plans to Stop Gout. Kumar, Ajay, and Wamik Azmi. “Phytomedicine: A novel alternative for treatment of gout.” Ann Phys Med 3 (2014): 80-8. Plants to Lower Uric Acid PDF.